1. Basic Research - this is basically the establishment of theories and the gathering of data and evidence to support the development of applicable technologies in the future. 2. Applied Research - using the theories and data acquired through basic research to develop technologies that can be used in the game. Each of these "fields" will have a starting concept that will have a defined Gold cost and length. Subsequent research projects in each field will have a variable cost and length, dependent on the GM. Applied Research will always have a variable cost and length, and it may require one or more concepts developed in the Basic Research fields. In terms of "trading" technologies, it would be allowed, but the faction that receives an already-researched concept would need to spend some time "learning" it and fitting it to their society. This will not take as long as discovering the concept itself, but will provide a means of balance. Alliances (might?) will be able to conduct joint research. (I'm unsure if you want this to apply to Basic Research, Applied Research - so long as both factions have the same or similar Basic Research concepts learned - or both). Initially, each faction could only research 4 things at a time. It doesn't matter if it's 4 Basic Research projects, or 4 Applied Research projects, or a mix of the two. Universities would increase the number of simultaneous projects, while Research Centers would increase the speed of each endeavor. As of right now, it seems better to NOT allow artifacts to be disassembled. Any benefits of doing so can be conferred through Paragons instead, which make more sense with the new research system. I do not feel like we should plot out the basic research because that seems a lot more restrictive for the player. I feel like we should have one base research for each of the fields, and have the player build off from there. It allows for more freedom and more creativity. Like I've said, I want to discourage the metagaming in thinking "I want steam power - what will I need to do it" and then only researching things that will lead you there. I know that me forcing everyone to progress the same basic path is far from ideal, but unfortunately that is the price that I am willing to pay. I want people to truly gauge the effort vs. reward in advancing to the next basic research and building applied research from what they already have. This won't succeed if players only tunnel their way to their end goals as fast as possible. But outlining it that way will ENCOURAGE thinking like that because then, people will just look at the tree, say "Oh, Steam Power is right there, and I can get to it by researching only ______, ________, and ___________. I'll get there in about 40 Turns!" And then focus on almost no other research. Actually, I wouldn't be revealing any technologies besides the next. Because you know, how on Gielinor would you know what comes after your current research? So you, singlehandedly, would be designing the Technology tree? I'd be alright with that. However, I'm still worried that you'll miss some things. Then go ahead and give your own suggestions for the progress of some paths. I'll consider them, but won't promise anything. So we're NOT plotting out the trees? Alright. Well, at least, the trees won't be plotted out for the public. William will probably make some nice charts for himself, though. I will. You can go ahead and do some suggestions as well, I do not even pretend to be omniscient and omnipotent in these things - help will be appreciated. The bad thing here is that I can only accept limited suggestions. Pretty much up to 1920 for Technology, like, Fluid Dynamics, Advanced Alloys, Basic Knowledge of Elements, some advanced machines, etc. For Magic, I'd suggest that Advanced Thaumaturgy, Inherent Magical Ability (Figuring out how to use inherent Magical Ability, like the Lunar Mages, instead of runes) Artifact Science (Creation of Minor Artifacts), And Magical Tongue(Conversion, Trade) for Philosophy. For Philosophy, I'd also recommend "Advanced Scientific Method" (SCIENCE), Advanced Religion, Espionage, etc. Yes, it was. I'll consider them. Alright, after a few failed attempts to do what I should have done with plotting the research fields, I'm starting to lean on Lime's direction with how the players should be given the freedom to plot their own course through them, with reason, of course. It's simply due to the fact that the fields are just far too broad for me to dictate which discoveries come first. Now, for research trading, I also propose the following: Either you have a professor spend a number of seasons writing the "guide" for their tehnology, which then gets sent over to the receiving party, who then has to spend time studying it, or you send a professor to their lands to teach it right away. The latter should be faster than the former. Yes, a safe, slow route or a fast, risky route. I like it. I'm still a bit weary of the idea - if William can't figure out how to progress through basic technologies, how will everyone else? They'll each have their own ideas, and there will be no standards - but charting out specific paths is definitely not easy. I think the real deciding factor will be when we we start playtesting. When I write up the draft, we'll do it more Lime's way. The problem isn't that I couldn't judge a progression path. The problem is with me dictating a stone-set path the theory progresses through. Even though some theories came later than others, there's no real reason why they couldn't have been discovered earlier. That's why I want to let the players try to find their own means to their wanted ends. I will judge if the progression is doable or not. I just hope I can be educated enough to do that. My guess is that players will try to progress too quickly. I don't know, it'd be nice to have some standards. There's no real good way to tackle this unless we limit it, like almost every video game in history has done. If players want to do it faster, I will quite frankly tell them it can't be done. All paths to the "Advanced" stages take about 13 research projects. I understand that's a lot... Perhaps we could allow "Concurrent research?" Well, that is not what we had in mind. That's all applied research, when the idea was to have basic and applied research, where basic is basically the trunk of the progression tree, and applied were the branches. The tree will keep on growing and growing, endlessly, but not just from the branches. It will also go taller. 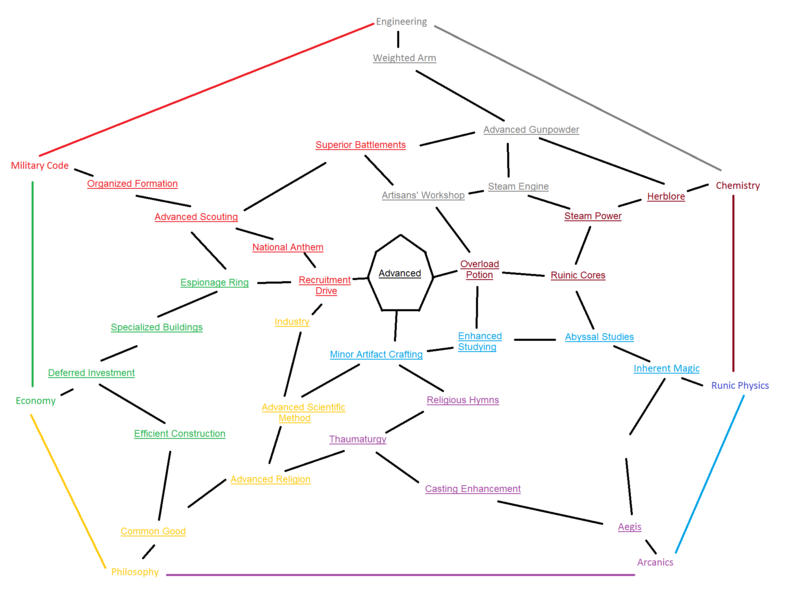 There is no distinction between "Advanced" and "simple" or "Basic" research, rather I'd like all research to be something proposed by the player. Oh right, basic research is theory, applied is applying the theory. I'm still heavily brooding on this system at work, even though we feel like we've reached a good point with it. I feel it needs a bit more structure, a way for players to have at least an expectation of, well, what to expect, without having things so clearly black-and-white that there's no variables in research at all. Right now, I feel like the best way to do this is stages. All basic research would have one stage: Discovery. Whether it's a new theory, new knowledge, or a new method to do something, it's completed in one stage. The success chance will depend on what the player wants to achieve and the GM's judgment. An estimate of how many turns it'll take may or may not be possible to produce. All applied research would have AT LEAST two stages: Concept and Delivery. There may be a great number of stages in between, once again depending on how ambitious the proposal is and the GM's judgment. Each stage would have a chance to succeed, like basic research. Each stage may or may not require a basic research project to be completed first; for instance, a stage which requires the fabrication of a very complex machine part might require a basic research project like "Advanced Metallurgy". The biggest issue I see is still the lack of standardization in basic research. I know it's not easy, though. » What Black Library titles are best to research Mordheim?